How I digitize my arts using photography! HomePhotographyHow I digitize my arts using photography! In this post, I am going to describe the activities that I perform before I come up with my arts ready for publishing. I hope this will help satisfy your curiosity about how I digitize my arts. Plus if you are also trying to digitize your arts and paintings but are unsatisfied with the outcome here's my approach. At first I place my arts in a place where there is adequate light (I usually do this on the rooftop). Then I support them with rulers or any other appropriate things. This helps them to get stretched and prevents them from being blown by winds. You can prepare more for lighting as well as many other things. However, I do just that. Then I try to shoot my best. But with nominal instruments the photos don’t come out good at once. So, I take more and more shots often varying ISO settings. After the shooting part is over I select some good images and then import them into Photoshop. I use Photoshop mainly for two tasks. Since the images of our arts don’t come rectangular as we desire, we have to crop them using perspective. You can correct the irregularities of your arts by using the perspective while cropping. For that, check the checkbox labeled “Perspective” on the toolbar just under the menu-bar. Note that this option doesn’t appear unless you select the “Crop” tool in the Toolbox. And also to learn how to do it right requires a lot of practice. So, take time to experiment this feature unless you understand how to do it right. Now after you have cropped the image, it’s time to enhance it a bit. For this, I use the “Auto Levels” command which automatically adjusts brightness, contrast, light, temperature, etc of the image. To use this: Go to “Image” menu in the menubar. Then Point to Adjustments and then click on Auto Levels. Alternately, press Shift+Ctrl+L keys simultaneously. This works well most of the time but not always. So, if you aren’t satisfied with the enhancement then, Undo the Auto Levels command, save the picture and import it to Picasa. Actually you can adjust the brightness and all other settings manually within Photoshop itself but since Photoshop has a lot of features it is very complex to do that. And moreover, even if you are good at Photoshop then still I would recommend you to check out the two software tools: Photomatix Pro (It is useful to create HDR images by Tone mapping) and Picasa from Google. Perhaps you may find them easier or more useful! Picasa allows you to adjust light and shadow; it involves no complex terminologies and is simple to use and that is why I am talking about this. 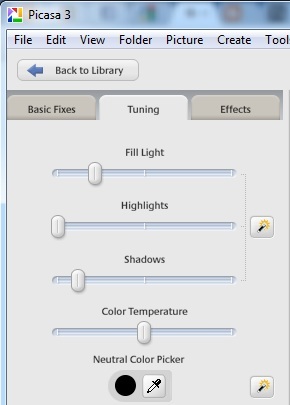 After you have imported the above image in Picasa click on the “Tuning” tab as shown in the picture. There are only four options. Among them ‘Fill Light’ and “Shadows” options are the most useful ones and these will help you add adequate light to your picture. This also needs your own experiments to understand it fully. I use this to add light to my art images and other photos as well. Slide the “Fill Light” slider and watch the effect on your image. The image becomes brighter and clearer. However, at some point it starts to become washed. At that point add some shadow. Increasing “Shadows” makes the shadows darker and heals the washed-out effect. Test the look of the image by varying these options. Finally choose the setting at which the image looks most beautiful. After the enhancing is done, the image becomes ready for publishing. This is how I do it. However, if you have more instruments then try to make appropriate use of them. You can find out how to make best use of them along with other information you’d want to know from the Internet. Therefore, don’t hold yourself back. Instruments are just one aspect of photography and knowledge, creativity, post processing techniques, experience, etc are the other. So, be proactive and go ahead in your career. Finally I would like to reiterate some tips you have been hearing often but are impeccably true. Learn to make best use of the resources you have. Read as much as you can about Photography. Take as many shots as you can and take some time to select the best photos. Use varieties of post-processing softwares. This is especially useful if you have no good equipments, like me, for photography. And most importantly, follow some great photographers on Google+, Facebook or on their blogs. If I’m trying to do photography with just a 6MP digital camera there’s no point that you can’t do it!